Can DST research cut fuel costs and improve vessel efficiency? Alison Caldwell: Underwater warfare. The term conjures images of sleek submarines launching torpedoes as Destroyers drop deadly depth charges. But, there’s another intractable and entirely silent battle being waged beneath the waves. While not as potentially lethal for the ships and crews of the Royal Australian Navy, the attacks are relentless and costly – both for the Navy and for Australia’s marine environment. Defence researcher Dr Andrew Scardino is leading the fight against a determined foe. Alison Caldwell: You won’t hear about it in news bulletins, but the Royal Australian Navy is at war. It is not a new conflict: In fact, it’s been raging since humans first stepped into canoes and pushed off from the shore. The enemy is the myriad of marine life that attaches itself to the underside of every vessel – great and small, military and commercial. The ever-thickening crust comprises animal and plant life ranging from barnacles and oysters to algae and bacteria. Literally glued to the hull and propeller, this biomass colonises every centimetre of sub-sea real estate at an alarming rate. The build-up is called fouling. And, as any old salt will tell you, fouling is, well, a drag. That’s because the rough texture increases friction and inevitably slows down the vessel, increasing its consumption of costly diesel fuel. Even relatively mild marine growth can quickly increase this fuel penalty by 10 percent, reducing the ship’s top speed and operating range, while raising emission levels and adding to maintenance costs. Left unchecked, heavy fouling can double the amount of fuel a ship would need to sustain operational speeds. Alison Caldwell: Fouling is also a serious biosecurity issue. Navy vessels regularly call at foreign ports ridding them of their unwanted stowaways is critical to reduce any threat to Australia’s native marine resources, fisheries and aquaculture industries. In Australia, biofouling research is being led by Defence Science and Technology in collaboration with academic and commercial partners here and abroad. The research is largely being driven by the imperative to cut fuel costs and improve vessel efficiency, as well as environmental concerns over invasive marine pests and the impact of toxic chemicals used in coatings. The partners are achieving success on a number of fronts, particularly in developing new ways to counter the intense fouling that plagues the Navy’s aluminium-hulled patrol vessels constantly patrolling the tropical waters off Australia’s vast northern coastline. Alison Caldwell: But, first a little of the history of this centuries-old battle and why victory may be in sight. Wax, tar, pitch, arsenic, sulphur, oil… the Phoenicians and Carthaginians tried them on all the hulls of their timber sail- and oar-powered trading and naval vessels, which held sway in the Mediterranean around 1500BC. Almost two centuries later, Britain’s Royal Navy turned to copper sheeting in a bid to repel the infestation. However, the advent of iron ships, and later steel and the lighter aluminium-hulled vessels, only made the problem of combating fouling even more complex – especially as a modern warship’s many sub-sea systems are just as susceptible to fouling as the hull. In recent decades, tin (which is now banned), chlorine, ozone, iodine, air, sound, vibrations, and a number of mechanical solutions have all been tried – most with only short term or species-specific success. 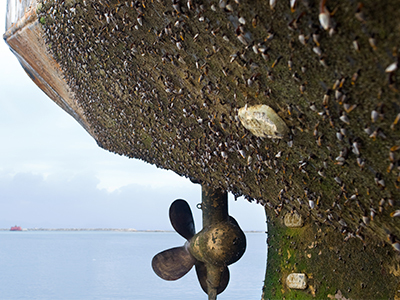 Indeed, it’s long been accepted that a single solution is unlikely as so many factors impact on biofouling rates: The diversity of ship types, the variety of hull forms and materials, variable speeds, the impact of the climates they operate in – even the length of time a ship spends in port. Alison Caldwell: Defence researcher Dr Andrew Scardino investigates novel fouling control technologies for the Royal Australian Navy. He says the warfare analogy is no exaggeration. Dr Andrew Scardino: These creatures are desperate to find a home to settle on. If they can’t, they die. But we’re trying just as desperately to repel them. It’s effectively an arms race because as we come up with new ways to deter them they either evolve better strategies to cling on or a new species replaces the ones that can no longer compete. Alison Caldwell: In Australia, one of DST’s roles is to verify which underwater coatings and antifouling technologies deliver the best performance for the Navy’s fleet. Its team works with coating manufacturers and academic institutions to identify capability gaps and develop targeted research programs. Alison Caldwell: DST has overseen the development of a new steel hull coating which meets the latest international maritime guidelines. Along with a significantly lower level of Volatile Organic Compounds (VOC), the coating requires only two coats instead of three to achieve the required Dry Film Thickness. The new coating was adopted for all of the Australian Navy’s steel ships in 2016 – a win for the environment and the Navy’s budget. Perhaps even more satisfying has been DST’s successful collaboration with its industry partners to develop two new coatings to combat fouling on aluminium vessels. Because the copper oxide-based coatings used on steel hulls corrode aluminium, these coatings could not be used to protect aluminium-hulled vessels – especially the Armidale Class and Cape Class patrol boats, which operate for extended periods in Australia’s sensitive northern waters, where fouling is intense. The latest hybrid hydrogel coating contains an aluminium-compatible biocide, copper pyrithione and has proven particularly successful in trials on Cape Class boats in the tropics. If the new coating continues to perform well, it’s likely to be used on the fleet’s aluminium vessels. Alison Caldwell: Meanwhile, the war’s being waged on many other fronts: The development of a fouling-rating tool designed for Australian conditions to quantify the cost of fouling; positioning torque meters on propeller shafts to measure its effect; foul-release coatings for propellers; as well as the use of micro UV-LED lights and 3D printing to protect critical internal systems, such as a ship’s sea chest. Dr Scardino’s team is also working with Flinders University researchers and industry partners to develop fouling protection for sub-sea sensors. One of the most exciting areas of research has been DST’s radical approach to protecting Collins Class submarines. A biocide has been incorporated into the elastomer or rubber skin that covers the hull, which is then slowly released through the skin’s surface over time to prevent fouling. Dr Scardino says field trials have proven very encouraging. Dr Andrew Scardino: Prototype elastomers have remained fouling free for over three years and we hope to completely eliminate the need to apply an extra underwater coating. By altering the thickness of the rubber skin, we expect to be able to increase the reservoir of biocide and extend the period fouling can be kept at bay. Alison Caldwell: As often proves the case, the advances that flow from these DST programs will have broader military and civilian applications, with the potential to deliver extensive economic and environmental benefits. Even a small reduction in fouling would save the Navy several million dollars a year, reduce fossil fuels and exhaust emissions, and give our fleet greater speed and range to optimise its vital role in maintaining Australia’s border security. I look forward to seeing more Australian-led anti-fouling technology surface in the future. Keep up-to-date with other startling developments in Australian defence science by following us @DefenceScience on Twitter, or download the DST App from Google Play or the App Store. The Defence Science and Technology podcast is a production of Defence Science and Technology, part of Australia’s Department of Defence.